To search for something specific use the CS Museum search box to the left. Click on the images for a larger view. Close each pop-up window before opening another. (continued from page 11) in height and eleven inches in circumference. The fruit is extra large and fine quality. Cherries and apples have made a fine growth being all that I could ask. Some of the apples being nine feet high and nine inches in circumference, which is good for thirty-three months from planting. The pears in my orchard are eight and a half feet high, clear of blight and disease. This section of country seems to be well adapted to pear culture. My raspberries and blackberries have furnished me with as fine fruit as can be grown. The strawberries are doing well, having made a solid mat of plants three and a half feet wide in the rows. Judging by the growth of the trees and the quality of the fruit, Noble county has as good fruit land as there is in the Union and should be made one of the largest producing counties. N. E. 1/4 Sec. 5, Twp. 21, R. 1 E.
Mr. Primrose is one of the most substantial citizens of Noble county. He has quite large property interest here and believes in the future of this county. He owns a valuable farm nine miles west of the city, which is well improved and upon which he has raised good crops. He is also engaged in the livery business in Perry and has some of the best residence property in the city. He is a native of Lewis county, Missouri, resided there twenty-eight years, and came to Cowley county, Kansas, where he farmed for sixteen years. He came to Mulhall, Oklahoma, a year before the opening where he engaged in the lumber trade. On the memorable 16th of September, 1893, he made the race for Perry and has been with the city since that time. Mr. Primrose is a good citizen of whom there are many in Noble county. This gentleman is one of the most progressive members of the Otoe tribe of noble red men. He has enjoyed the advantage of a liberal education and has not failed to bring it into good use in his home life and surroundings. 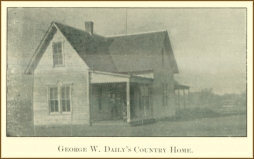 The illustration above in this column is a photograph of his home twelve miles north of Perry. He farms upon a large scale and is an industrious, good citizen. Mrs. Daily is also educated and the advantages of civilization are to be seen in their home and upon their farm. Every person acquainted With Perry and its pushing people knows J. E. Shanafelt, one of the city's most indomitable hustlers. He is the proprietor of the Post Office Book Store, and by his energies has made this one of the most important business enterprise of the town. All kind of books, school supplies, magazines, perodicals, newspapers, novelties, etc., are displayed here in this, convenient place for the public and the proprietor never tires of procuring articles pleasing to his trade. Besides conducting the store Mr. Shanafelt owns a fine farm in the Salt Fork Valley north of the city and has it well improved. He is an enthusiastic member of the order of Knights of Pythias and has been honored with the highest position within the gift of the body in Oklahoma, having just served as Grand Chancellor of the Territory. He is public spirited and engages in many good works for the benefit of the city. T. M. Richardson Lumber Company. This is the pioneer lumber yard of the city, having been supplying the wants of the people from the first day. They carry a large and complete stock of everything in their line and have served the public so faithfully that they have became known as the "old reliable." Geo. Todd, the manager of the yard, is one of Perry's foremost and enterprising business men and looks after the large property interest of his firm well. He is manager of the Perry opera house and it is through his influence that many of the best companies play in Perry. This firm is composed of two of Noble county's worthy officials, Hon. Thos. 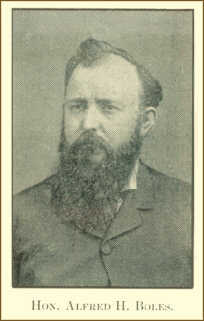 H. Doyle, representative, and Hon. Wm. 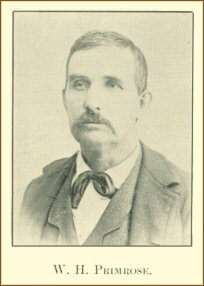 Bowles, county attorney. Both gentlemen are well known in Oklahoma politics, and have been prominent in making the history of Perry and Noble county. 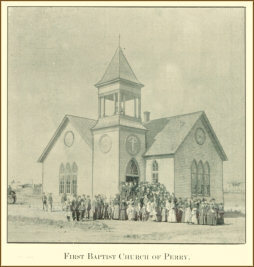 Mr. Doyle came to Perry from Kansas at the "opening," in which state he had been engaged in the practice of law for a number of years and had assisted in upholding the standard of Democracy, the party with which he affiliated. He was one of the earliest champions of the silver cause and had much to do with bringing about a union of the forces in the late campaign. He was recognized as the ablest member on the floor of the Territorial House cif Representatives last winter. and chainpionized a number of measures in the interest of the taxpayers and his constituents. He was speaker pro tem, and chairman of the committee on judiciary, author of the school land lease bill vetoed by the Governor, and of the penitentiary bill locating the institution at Perry, which lacked only a few votes of passing. Mr. Bowles, the junior member of the firm, is a Missouri Democrat of the old school and was honored by being elected state attorney of his county before he immigrated to Oklahoma. He has twice served the city of Perry in the capacity of city attorney and his record during all of this time will hear the closest scanning. He was elected to his present position on the silver ticket by a large majority, showing his popularity throughout the county. This firm has a large practice and are among the most successful members of the bar of Noble county.